A book fair for all! The Society for Door Step Schools was started in Mumbai in 1988-89 and expanded to Pune in 1993 with the aim to address illiteracy among the children from marginalized sections of society like children of construction labourers, pavement dwellers, slums (temporary and permanent) and other migrant communities. We have direct intervention programs where we cater to children at the construction sites, slums and migrant communities and school intervention program – Project Grow with Books (GWB) which focusses on improving the vocabulary and reading capabilities of children across 240 Corporation schools in Pune and PCMC. To inculcate reading in children at any age, it is very important to introduce them to a variety of books and literature. Keeping this in mind, our GWB team organizes different events like Book Fair, storytelling, story writing competition etc. across schools we work in. Our team started this year with a Book Fair at Pimpri Chinchwad Municipal Corporation’s Dnyan Jyoti Savitribai Phule School in Mhetre Slum, Chinchwad in the month of January 2018. Mr. Jangam, Center Head of the area inaugurated the Book Fair. He was accompanied by Corporator Mr. Dutta Kaka Sane, Ms. Sadhana Malekar, Ms. Yogita Nagargoje, Mr. Kundan Gaikwad & associates, SMC Vice president – Mr. Manik Mhetre, SMC members – Ms. Neeta Gawhane, CEO – Mr. Dnyaneshwar Nagargoje and other members. 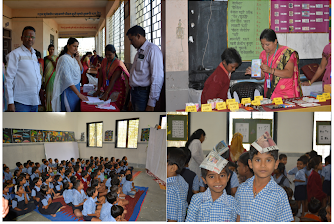 The fair was visited by 22 teachers, 60 parents & 607 children from three schools and 10 book fairies from DSS, Pune. The items displayed in the fair included variety of books, teaching aids for First grade Marathi and Arithmetics, multi linguistic magazines & newspapers, art & craft and science projects for children. The objective of organizing a Book Fair was to introduce children to an assortment of book publications, magazines & newspapers and fun ways to learn. All stalls were loved by children and adults alike. Specially the children between 3rd to 7th grades read all charts carefully and gave way to their curiosity by asking lot of questions. Teachers also encouraged children by explaining and conducting practical experiments wherever possible. Children exclaimed that they had never read the type of books and magazines displayed; teachers also expressed that they themselves were unaware about so many types of newspapers and magazines in different languages. Magazines like Champak reminded them of their childhood and how one book exchanged hands across an entire village and was enjoyed by all. The corporator of Chikhli exclaimed that if such programmes were held during his times he would have surely become an engineer by now. A teacher teaching the class 4 students thought that the exhibition was extremely encouraging and would surely help in the academic development of all the students who attended. Contributed by Team Project Grow with books, DSS, Pune.